The brushless DC motor is becoming increasingly popular in the industrial and HVAC sectors as it negates the mechanical commutator used in traditional motors. The brushless DC motor (BLDC) replaces the mechanical commutator with an electronic device which improves the reliability and durability of the unit. The electronics allow for accurate speed and torque control and ensure that the motor runs at peak efficiency. This is a relatively new class of motor whose applications have been increasing at a rapid rate each year, due both to declining costs as well as increasing functionality. An advantage of the BLDC motor is that it can be made smaller and lighter than a brush type with the same power output, making it suitable for applications where space is limited. Although the BLDC requires an electronic control unit, such devices are available as standard chipsets or modules from most of the major electronics manufacturers. Programming and set-up of the controls are very simple. Mass production and wide market penetration make these devices economical. Fig. 1: Typical 3-phase, 2-pole BLDC motor (Electrical Concepts). DC motors always have high starting torque – significantly higher than in the case of an induction motor. Another advantage of the DC motor are its linear speed torque characteristics, which are a direct result of the permanent magnets in the stator and internal feedback from the commutation the current in the windings is switched from winding to adjacent winding, based on the shaft position feedback from the mechanical commutator. For this reason, DC motors were preferred and are still used often for adjustable speed applications. The speed of the motor can be varied linearly (i.e. proportionately) to the applied voltage. The brushless DC motor is similar to the brush DC motor in that it has an internal shaft position feedback which controls which windings to switch on at which exact moment. This internal feedback gives both the brush DC motor and the brushless DC motor their unique characteristics: linear speed-torque curves which are well suited for speed and position control, and high starting torque. Fig. 2: Permanent magnet rotor of a BLDC motor . In a BLDC motor, the internal feedback is accomplished by a shaft position feedback sensor of some type which gives the required shaft position information to the drive electronics. The drive electronics in turn switches on the appropriate windings at exactly the right moment. This internal shaft position feedback also gives the BLDC characteristics similar to the characteristics of a DC motor: linear speed-torque characteristics and high starting torque. All DC motors consist of two magnetic fields. A fixed magnetic field which may be generated by DC-energised coils or permanent magnets, and a rotating field which is generated by switching the current to coils, which could either be in the stator or the rotor of the motor. In brushed DC motors, the rotary field is contained in the rotor and the current is switched through the commutator by rotation of the rotor. The basic principles for the brushed DC motor and brushless DC motors are same, i.e., internal shaft position feedback. When current is applied to the field coils, a magnetic field is generated which causes the rotor to move relative to the stator. As the rotor changes position, the applied current will switch, changing the polarity of the field, causing the rotor to rotate continuously. Several types of motor are available, single phase, 2-phase and 3-phase. The 3-phase application appears to be the most common and will be described here. Fig. 1 shows the diagram of a typical 3-phase double pole BLDC. The field windings of the 3-phase motor are connected in a star arrangement. Fig. 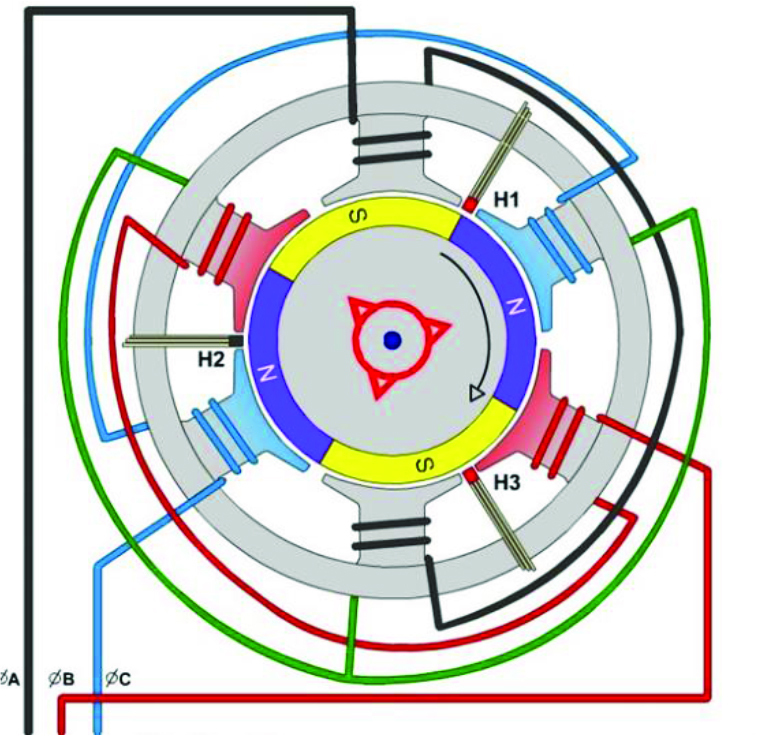 3: Three-phase motor rotation (Zou ). Inner runner motor, where the permanent magnets are placed on the inner rotor and field windings on the outer stator. Outer runner motor, where the permanent magnets are placed on the outer shell and the field winding are on the inner shaft. This is the most common type of BLDC and is capable of high power ratings. The rotor consists of permanent magnets and rotates as in a brushed DC motor. In the configuration, the permanent magnets are located on the outer shell of the motor and the rotating field is generated on the inner cylindrical stator. This type is limited in power rating because the magnets on the outer runner inhibit air flow and cooling of the motor. The configuration is adopted for flat profile motors with low power rating. The inner runner BLDC motor incorporates a permanent magnet in the rotor. The number of poles in the rotor can vary from two to eight pole pairs with alternate south and north poles depending on the application requirement. The flux density of the material should be high to achieve maximum torque in the motor. 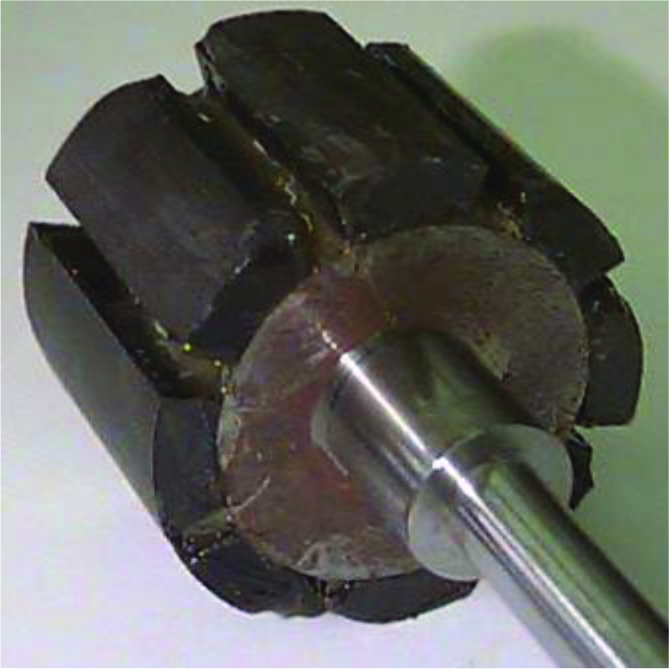 A proper magnetic material for the rotor is needed to produce the required magnetic field density. Fig. 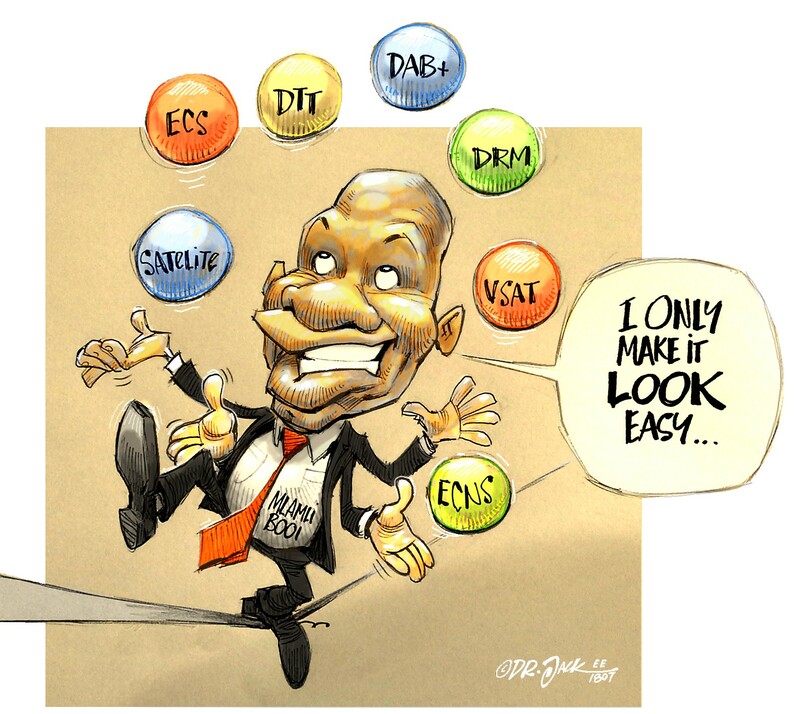 4: Control of rotation for 3-phase BLDC (Madaan ). Rare earth alloy magnets are used commonly for new designs. Some of these alloys are Samarium Cobalt (SmCo), Neodymium (Nd), Ferrite and Boron (NdFeB). 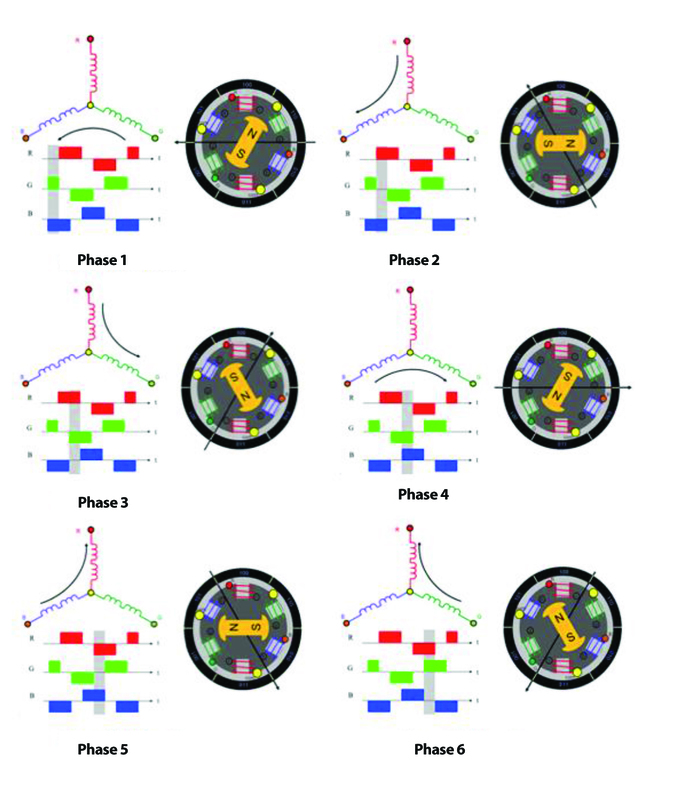 The rotor can be constructed with different core configurations such as the circular core with permanent magnet on the periphery, circular core with rectangular magnets, and others (see Fig. 2). The stator consists of laminated steel pressings in which the field coils are fixed. Position sensors are mounted in the stator. The permanent magnet rotor will follow the rotating field generated by the stator coils. An example of the rotating field of a three phase BLDC motor is shown in Fig. 3. Motor operation is based on the attraction or repulsion between magnetic poles. Using the 3-phase motor shown in Fig. 3, the process starts when current flows through one of the three stator windings and generates a magnetic pole that attracts the closest permanent magnet of the opposite pole. The rotor will move if the current shifts to an adjacent winding. Sequentially activating each winding will cause the rotor to follow in a rotating field. The torque in this example depends on the current amplitude and the number of turns on the stator windings, the strength and the size of the permanent magnets, the air gap between the rotor and the windings, and the length of the rotating arm. Fig. 5: Field winding drive voltages; 3-phase BLDC motor (Electrical Concepts). Energising individual windings in sequence is wasteful as only one winding out of three is energised at a time. Better performance is obtained by energising two windings simultaneously so that one winding attracts and the other repels, as shown in Fig. 4. The drive currents have a trapezoidal shape, as shown in Fig. 5 and are more complex than shown in Fig. 4. As can be seen from this figure, two of the three windings are operational at any position of the rotor. This creates a complex magnetic field in the stator which allows smooth control of the motor. This type of control was not possible with brushed commutator motors. The drive current for a BLDC motor follows a trapezoidal waveform, generated by on-off switching through the control gear. 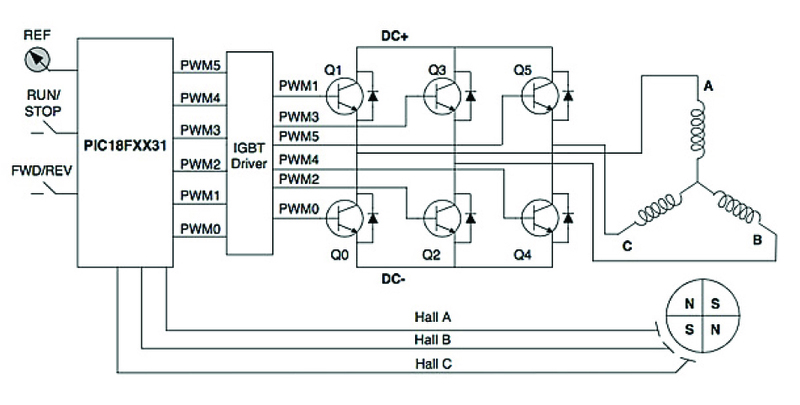 For a 3-phase BLDC, six steps or switching phases are used. Switching is controlled by means of a hall effect sensor placed on the stator. Fig.1 shows the placing of hall effect sensors (H1-H3) on the stator of a BLDC motor. In a brush-based DC motor, the commutators’ brushes control the current flowing in the fields. In a brushless motor, the current flowing in the field winding is controlled electronically, and some form of position sensing is necessary to achieve this. The position of the rotor is usually sensed using Hall effect sensors, which feed back to the controller unit. Fig. 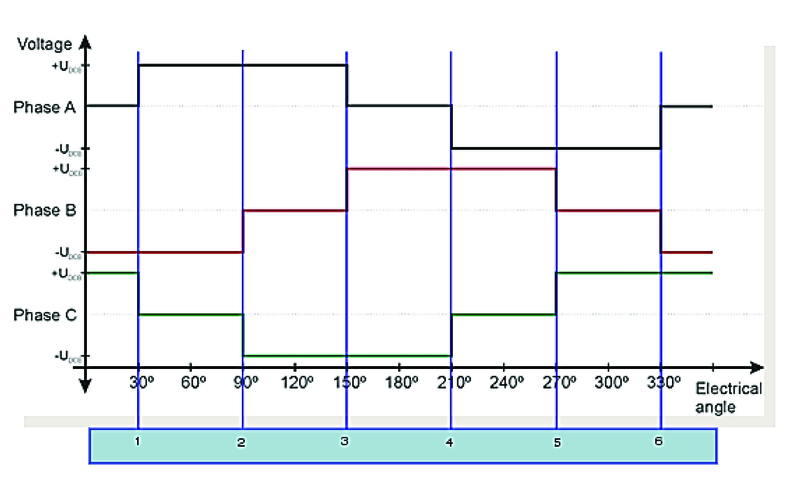 1 shows the positioning of the Hall effect sensors in a typical 3-phase BLDC motor. Fig. 6 shows the relationship between the Hall effect sensor output and the current applied to the windings. Fig. 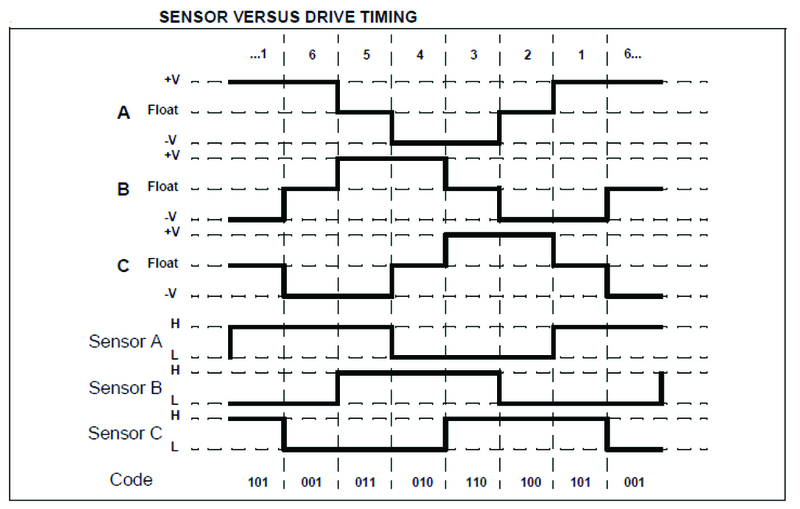 6: Sensor output versus drive timing (Electrical Concepts). The period of the output signal of the Hall effect sensor will depend on the speed of rotation of the rotor. Microchip controllers are available from a number of suppliers, greatly simplifying the design of control circuitry. Current is applied to the motor by electronic switches such as JFETs or IGBTs under control of the microchip. Fig. 7 shows a typical circuit. Speed control may be achieved by varying the pulse from the controller. The BLDC can be also made to behave like a brushed motor in which the speed is controlled by changing the applied voltage, rather than by changing the supply frequency. The supply frequency still changes but it does so as the result (not the cause) of the changing motor speed. Using this configuration, increasing the voltage of the pulsed DC supply from the controller will increase the current through the stator windings, so increasing the force on the rotor poles causing the motor to speed up, just as in a brushed DC motor. Although the motor runs at variable speed, it is still a synchronous application since the feedback loop triggers the inverter pulses in synchronism with the motor rotation, so forcing the supply frequency to follow the motor speed. This also means that the motor will be self-starting. Fig. 7: BLDC controller (Microchip). In a sensorless control system, the voltage induced in the non-energised coil is used as the position indicator. All electric motors generate a voltage potential due to the movement of the windings through the associated magnetic field. This potential is known as an electromotive force (EMF) and gives rise to a current in the windings with a magnetic field that opposes the original change in magnetic flux. In simpler terms, this means the EMF tends to resist the rotation of the motor and is therefore referred to as “back” EMF. For a given motor of fixed magnetic flux and number of windings, the EMF is proportional to the angular velocity of the rotor. But the back EMF, while adding some “drag” to the motor, can be used as an advantage. By monitoring the back EMF, a microcontroller can determine the relative positions of stator and rotor without the need for Hall-effect sensors. This simplifies motor construction, reduces its cost, and eliminates the additional wiring and connections to the motor that would otherwise be needed to support the sensors. This improves reliability when dirt and humidity are present. Electrical Technology: “Brushless DC motors”. J Zou: “Brushless DC motor fundamentals”, MPS application note AN047. P Madaan: “Brushless DC motors – Part I: Construction and operating principles” EDN network. Electrical Concepts: “Brushless DC or BLDC motor”, http://electricalbaba.com/brushless-dc-bldc-motor/. Atmel: “AVR194: Brushless DC motor control using ATmega32M1”, Application note 8138A–AVR–04/08.